Just a couple of months back, bananas was considered as one of the most expensive fruit in Australia due to cyclone Yasi. Before the cyclone, they are about AUD$1-2/kg when they are in season and they were selling at a shocking price of AUD$13/kg in Woolies and Coles! For this reason, I've put aside all my banana baking projects. For this bake-along, I'm glad that Lena, from Frozen Wings has suggested "Go Bananas" as our baking theme. Together with Joyce from Kitchen flavours, Lena and I are cooking or baking any food as long as there is banana in it. Now, this is a great reason to revive all my bananas baking which includes this yummy Hummingbird Bakery's banana loaf. 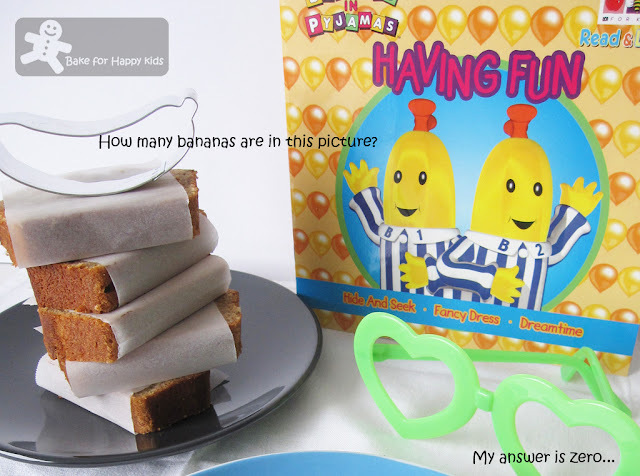 There is slices of a Banana loaf, a "Banana in Pajamas" book and a Banana cookie cutter but NO real banana in this picture...LOL! Put the sugar and eggs in a freestanding electric mixer with a paddle attachment (or use a handheld electric whisk) and beat until well incorporated. Beat in the mashed bananas. Add the flour, baking powder, bicarbonate of soda, cinnamon and ginger to the sugar mixture. Mix it thoroughly until all the dry ingredients have been incorporated into the egg mixture. Pour in the melted butter and beat until all the ingredients are well mixed. Pour the mixture into the prepared loaf tin and smooth over with a palette knife. Bake in the preheated oven for about 1 hour, or until firm to the touch and a skewer inserted in the center comes out clean. Leave the cake to cool slightly in the tin before turning out onto a wire cooling rack to cool completely. Note: I've made this loaf with 2/3 of the recipe using 10 x 20 cm loaf tin. I have never had ginger in banana bread. I bet it tastes good. Your how many bananas in the picture joke was too funny! Honey Bee Sweets: You are welcome to join us for our bake-along. We are baking pizza and will be posting our pizza bake on 6 Oct 2011.
zoe, i was thinking of making a banana bread too , then i came across that ice cream post in the internet. I would very much like to try this maybe with normal light brown sugar. haha! i was about to count the banana slices just now..
A very nice and perfect Banana Loaf to go with Lena's Banana ice cream and Joyce's Tropical Crumble. Perfect for picnic! I just baked 2 banana loaves recently but didn't take any photos of it. Yours have such fine looking crumbs which I like. I heard about this crazy banana price in Australia, so glad you can now bake with it. This look healthy and good. Cake looks super moist and prefect.. Thanks for stopping by my blog. 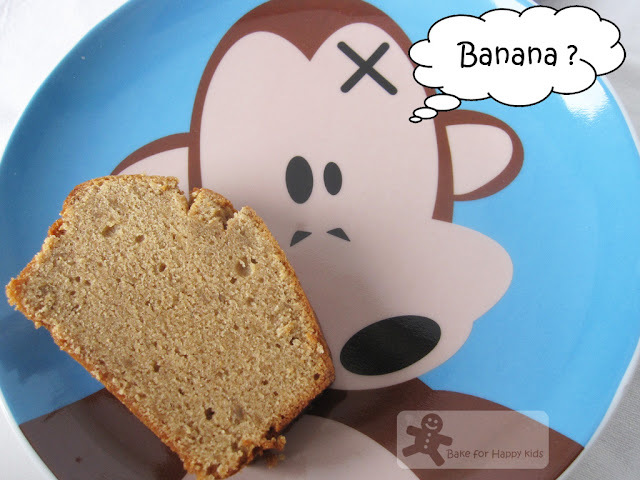 Your banana loaf looks so good, and such a cute presentation. Love that extremely cute monkey plate. And the bread looks yummy! Sounds lovely with unusal flavors - really love your photos too - very fun!! I got a ton of banana's on my counter so I'm going for this! Your photos are too cute for words. I just love that monkey plate! Coincidentally enough, I'm actually eating banana loaf right now, but mine is store-bought. Yours looks much, much yummier... wish I could trade! LOVE your monkey plate!! I want one!! I haven't had banana bread (or bananas for that matter) for ages because they're so expensive :( Your banana loaf looks delicious though! Now i want some!! Zoe, lovely presentation. Your banana loaf looks so good. Jeez those are some expensive bananas! Love the recipe, it looks delicious. I will have to check out this cookbook too. This bread looks wonderful. I love my banana bread recipe, but yours sounds pretty good too. Maybe I'll try it next time. Thanks! I'm never a fan of Bananas in PJs but I love bananas. Especially 'rastali' kind. Love your loaf. i made this yesterday & love it to the max! thanks!!! Mrs plain-june: I'm happy that you have made this and like this cake. I like to use 1/2 a teaspoon extra of ginger rather than less; which is very well-received. Also, my bread turns out a lot darker than that in the picture (is that a photo of bread made using the Hummingird recipe??). Tip re bananas, use over-ripe where possible as it results in a much better flavour. When you've got a bunch and the odd banana starts to go a little past premium eating ripeness; peel it and freeze it. I always end up with a little stockpike in the freezer which I bring out as and when I'm making the bread. Of course, Kate! This bread in my photo are made using the Hummingbird recipe. 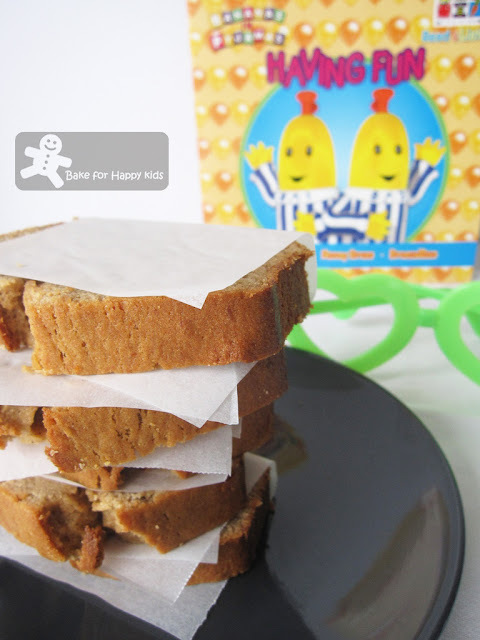 There must be slight variations in terms of the ingredients used for baking this recipe. Thanks for your tips.